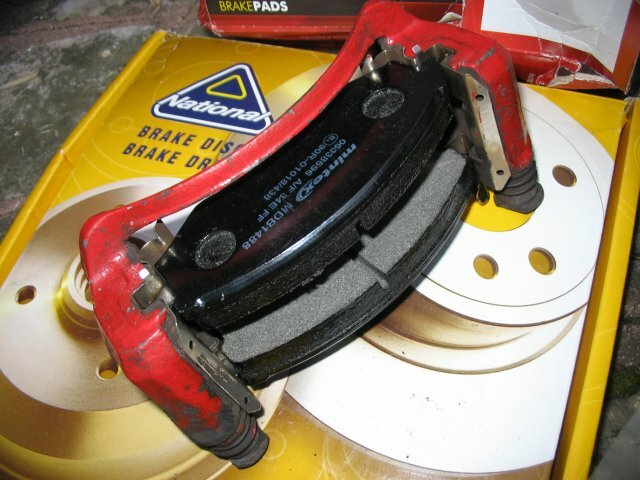 Ever since the banning of asbestos in brake pads the substances used to maintain sufficient braking properties (e.g. high friction, resistance to heat etc) have resulted in pads/linings being far harder than they used to be with the net result that discs tend not to last as long these days. 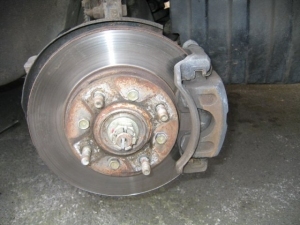 Hence, you may find you're having to replace the discs (fronts at least) every 40k miles, or less. The job is not all that difficult as, like most jobs on the car, if you take the time to try and understand how the system works and break it down into smaller more manageble steps then it's well within the scope of an average DIYer. First and foremost however you must remember that the brakes are arguably one of the most safety critical parts of a car and hence the utmost care should be taken when working with them. If you are in any doubt about your ability to carry out the work to a high safe standard then leave it to the pros - you cannot put a price on life. That said, changing the discs and pads is a relatively simple procedure and does not require any disruption to the hydraulic side of the braking system and hence as long as you put back all the bolts you remove then you really can't go far wrong. If you want to err on the side of caution then don't change all four corners at once - start off with just the rears and see how you go as they are less critical than the fronts - relatively at least, in absolute terms they're still essential! Pads and discs must be replaced in pairs (i.e. both sides of the same axle) otherwise you might end up with uneven braking. Fronts and rears can be considered separate - indeed the fronts wear much quicker than the rears and usually require more frequent replacement. I would recommend replacing the pads at the same time as the discs (and vice versa) as otherwise you may experience premature wear as the friction surfaces won't marry up from the start. Besides which, the costs are relatively affordable for good quality pattern parts to enable you to change them together thus killing two birds with the one stone. 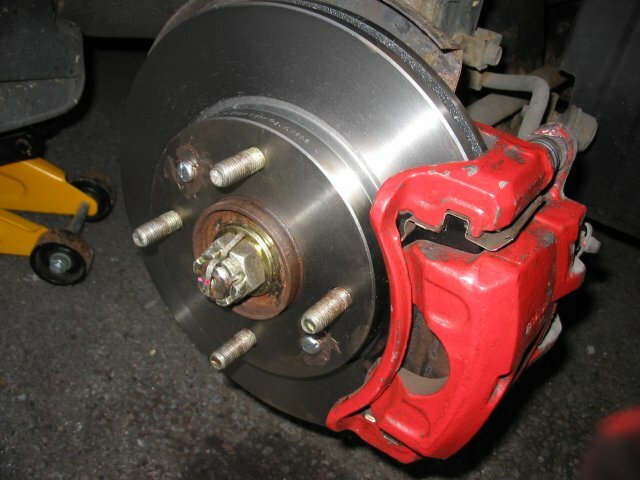 With regards to the purchase of parts, I can recommend www.brakepartssuperstore.co.uk for standard discs and pads as their prices, quality, service and delivery are all good. This is probably an ideal time to mention the issue of captive and non-captive discs as, like you'll see at the aforementioned site and others, there are two discs listed for the Gen 1 ('96-'02) Coupe with nothing distinguishing the suitability of each (date alone is insufficient). Many of the earlier models of the Gen 1 were fitted with what's known are known as captive discs on the front - the distinguishing 'feature' of these discs are that they are fixed to the hub by means of four large bolts through the hub face. On later models (including all subsequent generations) these were replaced with the more-standard non-captive discs which forego the large bolts and rely instead on the wheel itself being bolted to the hub through disc (note that non-captive discs also have a small grub screw holding the disc to the hub - this is not a load bearing fixing but rather simply to keep the disc in place whilst the wheel is off). So, which have you got? Well, not only do captive discs have the four bolt heads clearly visible (see Figure 2) but they also differ in other dimensions as the diagrams below illustrate. Why the two types? Well, without going into too much detail (it's beyond the scope of the purpose of this guide) there are, as always, pros and cons - captive discs are more securely (and accurately) fixed to the hub and are designed to be machinable in situ hence a truer friction face can be achieved. The effect of this is the potential for more effective braking ability along with fewer vibrations - an important factor given the tighter tolerances of wheel bearings on modern cars. However, the downside to this construction method is the difficulties of maintenance and the requirement of the wheels to accomodate the bolt heads. This HowTo has been written primarily based on the Gen 1 however it will not differ significantly for other generations, and indeed even other makes and model of car ('standard' ones at least). The photographs are of the front (with non-captive discs, except Fig 2) however the differences between that and the rear are minimal and will be highlighted as required. The standard rules regarding safety apply - do not work under a car supported solely by a jack as they can fail without warning. Ensure the vehicle weight is supported by suitably placed axle stands (more than one if possible) and that the remaining wheels are securely chocked. These measures are of particular importance on this job as there could well be a fair bit of heaving and heavy hitting required to shift stubborn components! 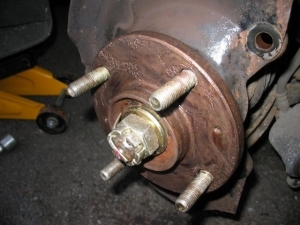 1) Loosen the wheel nuts, chock the wheels (handbrake must be off if you're doing the rears), jack the car up, removal the wheel and rest the car on axle stands. 2) Before removing the caliper it is worthwhile sussing out what's what and how it all connects together. The principle of caliper function and operation is essentially quite simple. 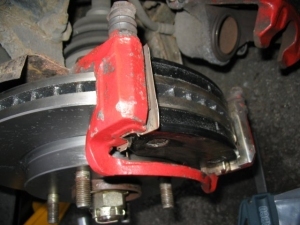 The caliper can be broken down into essentially two parts - a movable part that sandwiches the brake pads between a piston and hard stop, and a static part that is securely bolted to the car and serves to hold the pads in guides in the proper position on the face of the disc. The movable and static halves of the caliper are connected together via sliding guide pins. Looking at Figure 1 you can make out the movable half of the caliper (the main 'body' in the centre and right hand side of the whole caliper), the static half (the taller, thinner, curved section going from top to bottom) and you can just about see the rubber boot covering the upper guide pin which connects the two halves together (the lower pin is not shown). Don't be concerned that your disc doesn't look quite as shiny as mine... that's the new replacement! 3) There are various ways of actually removing the caliper in terms of what order you do things in however for this particular job I recommend the following. Loosen the two 14mm guide pin bolts but only enough to shift them - they can be stubborn to move initially (as can all brake-related components given the environment they operate in) and so it's beneficial to have the caliper still firmly attached to the car to allow additional mechanical leverage. Once the guide pin bolts are loose (i.e. only a single turn or two) then you can proceed to remove the main 17mm bolts (two of) that secure the static part of the caliper to the car - again these could take some force to get moving (a soak in WD40 may help). 4) With the securing bolts removed, lever the caliper assembly off the edge of the disc. This will likely require some 'persuasion' as not only will the pads be a close fit to the disc (for the rears, make sure the handbrake is off or they'll never budge!) but there could also be a lip formed on the disc if it is worn (and/or corroded). Wedging a suitable tool (screwdriver, piece of wood etc) between the edge of the disc and the caliper (alternating top to bottom) should enable you to lever it off. 5) Once off, hang the caliper from a suitable point (e.g. suspension coil) with some string/cable-ties. Do not let it hang by the brake line as this can damage it. We'll be partially dismantling it later however for now we'll leave it alone until we remove the disc - I recommend doing it this way as if you can't get the disc off then you may end up having to throw the towel in and take it to a garage and there's no point in making extra work for yourself by having to reassemble the caliper. 6a) Captive - (early Gen 1's, identifiable by the four lug holes and four bolt heads and the 86mm hub hole as opposed to 69mm) - The disc is actually positioned behind the hub and is firmly attached using four bolts passing through the hub from the front. Removal of the disc requires the outer part of the hub to be dismantled first. 6b) Non-captive (identifiable by the four lug holes and one (or two) small screws on the face as per Figure 1) - The discs are positioned in front of the hub and sandwiched securely between the hub and the wheel (when fitted). You should see one or two screws holding the disc to the hub - these serve merely to hold the disc onto the hub whilst the wheel is off. In true Haynes style, simply remove these. This of course can usually be translated to mean 'these stubborn buggers will take some serious work to shift' - I've found the best way, if they are so stubborn that they can't be shifted with even the biggest force on a standard screwdriver/wrench, is to use an impact wrench/driver (<£10 and very handy to have around as you'll be able to resort to it before you've mangled screws/bolts/nuts beyond rescue!). The screw heads (Philips) are somewhat soft so you may find the head chews before it even starts to turn. In this case a Dremel-type tool (another handy-to-have-in-advance tool) can be used to cut a slot in the head to give the impact drive more purchase with a meaty flat head bit. Heating the disc may prove futile as it's effectively a huge heatsink and so you're unlikely to get any reasonable expansion around the thread. If the worst comes to the worse you'll have to drill them out or lob the heads off with a cold chisel. Once they're out the disc should now come away from the hub. Again, in the world of Haynes I'm sure they do however for everyone else it may require anything from gentle persuasion with a rubber mallet to full-on wallops with a lump hammer. Be mindful of the bearings (and of course your eyes!) as whilst they're tough they're not indestructible. Try initially striking the disc from the front (on the central face between pairs of wheel lugs) and spraying WD40 from all angles (particularly behind as it's the hub/disc mating face that is usually the culprit). For maximum effect any hammer strikes should be done on opposing sides of the disc in turn bearing in mind that if the disc starts to twist relative to the face of the hub this will only add to the difficulty of removal as the wheel lugs will start to catch on the disc. Persistence will pay off; trust me! Ultimately the disc might need attacking with an angle grinder and then striking off with a cold chisel but finger's crossed it doesn't get to that stage. 7) The brake pads can now be removed from the caliper - this is best achieved by removing the 14mm guide pin bolts (you did loosen them in step 3 didn't you?) and separating the two halves of the caliper. Leave the movable (piston carrying) part hanging and remove the static part holding the pads. These will be held in primarily by crud now that they don't have a disc between them and caliper piston behind them (they are after all 'floating' in guide rails in order to enable them to slide in/out and adjust to the disc surface) however they might still require a tap with a hammer. You will find it easier to remove them in the direction of each other as the guide brackets are sometimes shaped to stop them coming out of the back (more to ease reassembly than anything else). Once out clean the whole lot ensuring that the crud in the guide rails (where the pad 'ears' were located) is removed. It's worth inspecting the condition of the guide pin boots at this stage as if they're perished then it is only a matter of time before one, or both, of them seize (particularly on the rears where they don't see much action). 8) Back to the piston part of the caliper (Figure 3) remove the large metal plate (only on the rears) if your new pads came with a replacement - this serves to reduce vibration and brake squeal and is most required on the rears where less braking force is applied. Then, clean the caliper (ideally with brake cleaner but whatever you use make sure you don't damage/bypass the rubber piston seal) and you are now ready to retract the piston back in to the caliper - this is necessary given that your new pads and disc will be thicker than the old ones and hence will require the caliper to be wider if you're to have any hope of reassembling it all. How this is done depends on whether you're doing the front or rear however in both cases the job will be made easier if you loosen the cap on the fluid reservoir (don't remove the cap entirely - you don't want anything dropping in or it being exposed to too much air as it is very hydroscopic hence will absorb any water vapour it can which will ruin braking performance if it boils). However, be mindful of the fact that if any brake fluid has been added when the pads were worn then you may find the level rises above the lid of container - make sure this doesn't get anywhere near your paint as it's a more effective paint stripper than paint stripper itself! (wash it off with plenty of water if this happens, oh and try not to touch the stuff yourself as it's not particularly good for your health). 8a) Fronts - The piston 'simply' requires pushing back into the caliper. Favourite methods vary but I use either a G-clamp, piece of wood to lever it against the caliper body or a spanner held across the piston face and pushed from either end etc. Heck, you can even use a special tool designed for the job. In all cases take it slowly as you must remember that you're trying to push a relatively large volume of non-compressible fluid from a wide piston into the narrow bore of the brake line - at best this can only be achieved at a slow pace. You will find that once you've started it moving it tends to get easier - you probably won't see it moving to start with but just persist and keep telling yourself that it will move! Push until the rubber boot appears as retracted as it will reasonably get (i.e. so that the piston is flush with the boot) - you don't really want to push it too far in case you end up breaking the seal. You can always go back to it if you find it's not retracted enough when you come to reassemble. 8b) Rears - For these it's the same principle as the fronts yet with, quite literally, an added twist. The rears have the handbrake mechanism built into the back of them consisting of a nut on a threaded shaft (or a variation thereof). The handbrake pushes the back of the piston via this self-adjusting mechanism and the nut slowly rotates over time to make up for the thinning of the pads/disc. To retract the piston you cannot just push it back in as the mechanism will be right behind the piston (even with the handbrake off - which, incidentally, you must make sure is! ), instead you have to rotate the piston clockwise whilst pushing it in - this is easier than it sounds if you use a pair of needle-nose pliers located in the recesses on the piston face. Again, take it slowly and you'll gradually start to wind it back in. Just turning the piston won't get you anywhere (it'll just keep rotating) - it needs to be pushed in at the same time. Finish off when the piston is flush and aligned such that the grooves are horizontal to the caliper body - a lug on the back of the pad will be required to sit inside one of them (to stop the piston rotating instead of the self-adjusting nut). 9) It's worth pointing out that at this stage you must not press the brake pedal as this will cause the unimpeded piston to be pushed out. Also, make sure you now replace the cap on the brake reservoir as you'll forget otherwise and you don't want this stuff splashing around the engine bay (or being contaminated for that matter). 10) The order with which you proceed is open to debate. I prefer to get the pads ready in the static part of the caliper and on to the car before reassembling the entire caliper. Try the pads for fit in the caliper whilst everything is clean to get a feel for how they're going to go in. They may require some persuasion, particularly if you've replaced the plate in Step 8 (only for the rears) as there will be plenty of spring in it. You may also find you need to file the 'ears' of the pads to make them fit - this is quite common. Don't be worried about them being a tight fit as if you can just about get them in by hand then that's ideal - remember the piston force is immense and so will have no trouble making them slide. If they're too loose you may find they squeal as they vibrate under load. Check the other side of the car if you can't work out which way they fit (Figure 4 shows them fitted if that helps). Just remember two things: i) the friction material must face inwards (i.e. the the face of the disc)!, and ii) the pads are curved to fit the shape of the (circular) shape of the disc. Abiding by these two rules I don't you could really go wrong. Note also that most pads will come with some sort of anti-squeal backplate either fitted or in the box so make sure they're ready to be fitted and also that one pad will likely have a metal audible wear indicator (a fancy name for a bent piece of metal which starts grinding away at your disc if the pads get too thin) and so make sure this one is fitted on the correct side of the caliper (check the other side, but it's usually on the inner side of the caliper) in case it foulds anything if placed in the 'wrong' slot. 11) Once you're happy you can get the new pads in and that they fit you're ready for the proper (re)assembly. To reduce squeal and corrosion you should apply a coating of copper grease onto the backs of the pads (and piston face if you like to be thorough) and (optionally) the metal plates/runners that the pad ears/lugs slide in. Apply it sparingly as you really don't want to get any of it on the friction material, either now or when in use. There is no completely satisfactory way of degreasing a brake pad - don't let this frighten you but just bear it in mind with all this grease around. Position the pads in the holder such that there is sufficient space for the disc to slide between (just about - with new pads and disc there is not going to be much slack available) however their exact position will be dictated when the rest of the caliper is fitted to it. 12) Put the caliper aside for a moment as you're now ready to fit the new disc. It will have likely come with a protective coating to stop it rusting in storage/transit and this should be removed with meths (white spirit is rather greasy). With it, and the hub face, cleaned and ready to go smear a light coating of copper grease on the hub face (see Figure 5) as this will hopefully minimise corrosion and make it much easier to remove them next time. Again, keep the grease off the disc surface. For non-captive discs put copper grease on the retaining screw(s) threads and heads/washers to stop them corroding in place. If you mangled the screws whilst removing them then you can actually safely leave them out or replace them (M6x15mm for Gen 1?) [Note: Captive discs will require a different reassembly as per the reversal of Step 6a). Ideally you would now check the runout of the disc with a dial-test indicator (to <0.04mm for Gen 1) and rotating the disc position relative to the hub until it is straight. In practice, with a clean hub and disc, you shouldn't have problems. Put it this way - your average grease monkey would certainly not check them like this. 13) With the disc back on, slide the static part of the caliper around the disc (Figure 6). 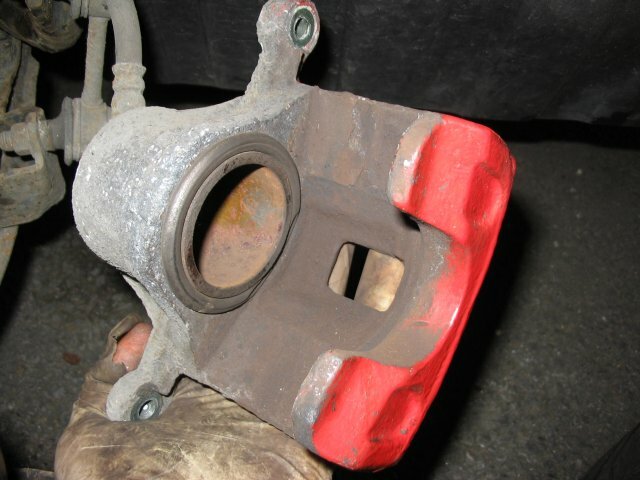 You may find that depending on exactly how you positioned the pads some adjustment will have to be made in order to align the caliper with the bolt holes on the knuckle. With it in place replace the 17mm bolts (tightened to 69-85Nm for the Gen 1). 14) Now it's time to replace the movable (piston) part of the caliper around the pads and into place. With the pads pressed against the disc (check both sides) here is where you find out if you pushed the piston back in far enough - it could well be a close fit. Note that, for the rears, you need to ensure that the lug on the back of the pad aligns with the depression on the piston face (remember this serves to stop the piston rotating with the handbrake) - there is some room for play here. Finally, align the guide pins with the bolt holes (noting that the pins might need rotating to fit - the faces are not circular as this stops them rotating when tightening). Replace the 14mm bolts (tightened to 22-32Nm for the Gen 1). You should now be in the same position as Figure 7! 14) Replace the wheel (put copper grease on the rear of the wheel to minimise the risk of corrosion, particularly for alloys, where it meets the disc/hub) and drop the car. 15) Once you've done the other side (both sides must always be done at the same time otherwise you may end up with uneven braking) you're good to go however before driving off press the pedal a few times to push the push the piston up to the pads and against the disc. If you don't you may find you don't stop when you get to the end of the road... Needless to say start of very slowly and check that the brakes are working and remember to take it easy for a while as the pads will not have bedded in to the surface of the disc. You may find for 10's of miles (if not for the first couple of hundred) that the full surface of the pad is not yet in contact with the disc. If you've replaced the rear discs/pads you may also find that the handbrake pulls up very high and, possibly, doesn't appear to work even at the highest setting. It will take a while for the self-adjusting mechanism to take up this 'slack' and it only really works effectively whilst moving slowly so just give it time. There is no reason you will have to manually take up the 'slack' in the cable given that you've fitted thicker pads/discs (if anything you'd need to put extra slack in given the pads now hit the disc sooner). 16) Avoid hard braking during this 'bedding in' period to prolong the life of the pads - do not attempt to quicken the process by constant or harsh braking - at best you'll end up glazing the pads and reducing their effectiveness.